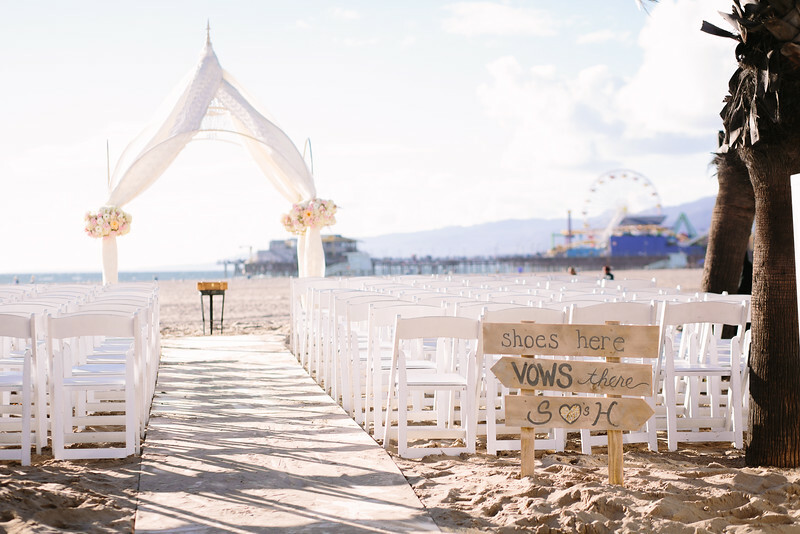 Hilary and Sam had a beachfront wedding that still continues to make me want to dig my feet into the warm sand of Santa Monica's shoreline. Located in front of the Casa Del Mar, the couple's ceremony featured one of our favorite canopy designs with a chandelier suspended from the center. Lace fabric was wrapped around the top of the structure and cascaded down the sides, cinched at each post by a beautiful lush floral cuff. Take a look at one of my favorite design elements, our custom entrance sign. I'm so in love! Take a look at more gorgeous images from Brian Leahy below! Hilary's bouquet is totally one of my favorites! Blush astilbe and spray roses will forever have my heart, and I just love the way this handle came out! The indoor reception, also held at the Casa Del Mar, continued the use of lush florals, but added in black tablecloths and gorgeous gold shimmer table runners! 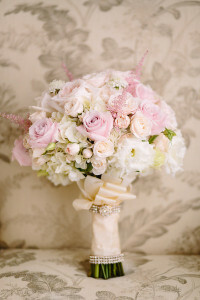 I just love the way the gold and black colors contrasted with the touches of blush. The tall, lush florals were placed atop golden candelabras that were decked out with draped crystals. I think they perfectly united the chandeliers from the ceremony with reception! And last, but surely not least, Hilary and Sam's gorgeous cake!!! 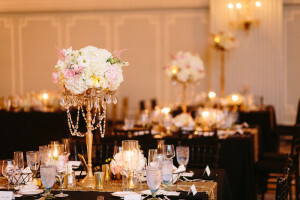 I just love all of the gold and black (and of course, another touch of our blush florals). Congrats to Hilary and Sam! Thank you to the wonderful vendors that participated in this event!